Touch 'n Foam Professional 2-Component Spray Foam Kits provide quick and simple solutions to air sealing projects in residential and commercial buildings. Simply "point, spray and watch" as the foam expands to create an air tight seal that will not shrink, compress, settle or biodegrade. Easy to use, the Pro System 600 kit is great for larger projects where higher yield provides greater economy. LIMITED WARRANTY: Manufacturer will not accept liability, for products used as directed, more than replacement product or sales price refund within one year from the date of purchase. 1 (888) DAP TIPS. GREAT STUFF is even Greater! Introducing the new patent-pending GREAT STUFF SMART DISPENSER. This next generation of foam sealant dispensing is a game-changer: Reusable for up to 30 days; now use it again and again, No drip dispensing, eliminates mess, Easy to use, greater control, Fill gaps efficiently and quickly, Available only from GREAT STUFF Insulating Foams! GREAT STUFF Window & Door Insulating Foam Sealant Twin Pack with QUICK STOP Straw Technology is a one-component, low pressure-build, flexible polyurethane foam exclusively formulated to air seal the gap between a window or door frame and its rough opening. The foam expands to generate an effective seal, blocking energy loss and moisture entry. When cured it remains soft and flexible. Cured foam can be stuffed back into the gap without trimming. LePage. QUAD. Foam Sealant is a single component, minimal expansion and low pressure polyurethane foam packaged in a pressurized metal container. It is dispensed in bead form for sealing gaps and cracks, holes and voids around windows and doors, in most types of construction projects. The product exhibits slight to moderate expansion during application and cures upon reaction with moisture to form a flexible, urethane foam. The closed cell structure of this material provides an R factor of 5 per inch of cured foam making it an efficient method for stopping air and moisture infiltration and expensive warm and cold air loss between windows and rough frame. QUAD. Foam Sealant will not warp or deform windows and doors. QUAD. Foam Sealant adheres to all types of building materials including wood, concrete, and drywall and is compatible with asphalt and butyl flexible flashing. 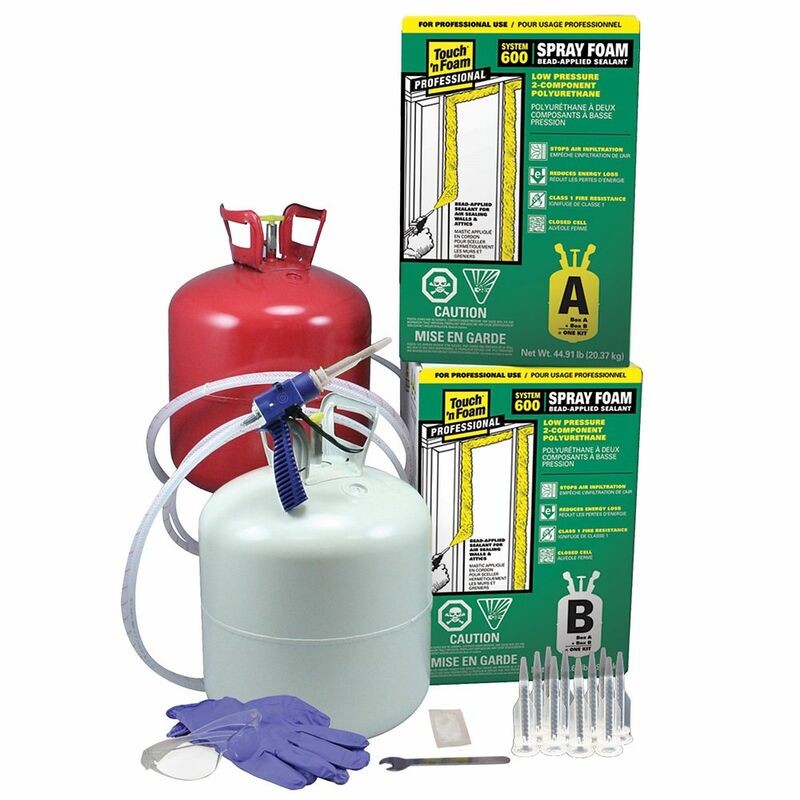 System 600 2-Component Spray Foam Insulation Kit Touch 'n Foam Professional 2-Component Spray Foam Kits provide quick and simple solutions to air sealing projects in residential and commercial buildings. Simply "point, spray and watch" as the foam expands to create an air tight seal that will not shrink, compress, settle or biodegrade. Easy to use, the Pro System 600 kit is great for larger projects where higher yield provides greater economy. System 600 2-Component Spray Foam Insulation Kit is rated 3.9 out of 5 by 7. Rated 5 out of 5 by Anthony K from Excellent Product Just follow the instructions. Respect the storing conditions, application conditions, surface and product temperatures etc and it will work perfect. Rated 5 out of 5 by Dano from Great product if used as directed So far Ive used 3 of these kits to spray the concrete blocks in my basement, room by room at three different times during the winter. Since most complaints I read about the product were yield related and likely associated to product temperature i wanted to ensure i got the most for the money since its quite expensive. Also, each of the 3 times i used this was during the winter and the block surfaces were quite cold which is not recommended so I wanted to compensate by ensuring the product was as warm as i could possibly get. The technique i used was to purchase two 80W battery blankets and ziptied one around each tank and let them stayed plugged in for two days prior to use. These dont get hot enough to cause any issues with overpressure but overtime get the product much warmer then ambient room temp can achieve, especially during winter. Each time i was able to get atleast 90% of the rated coverage even with the cold contact surface. The quality was also great with no bubbles. The only other suggestion i would make is that you quickly check how light the bottles get as your using it and when they start to feel empty pay attention to color changes or if it starts to spray shiny. Then stop immediately or whatever you spray will not harden. Overall worked great. Rated 2 out of 5 by ramboot from Check the expiration I bought this product and it did about 350 square feet instead of the 600 it was rated for. One tank was still half full but the other was empty. (Gerrard store gave me 20% refund) So I bought the next size down to finish the job but near the end the stuff was going on weird. I later realized that Gerrard had sold me an expired product. In hindsight I think that the first purchase may have been a used return. This store doesn’t sell a lot of this product and it has a shelf life so check the box first. Rated 5 out of 5 by Michel from great product for sealing i bought this to seal my old basement that is made with dry stack stone.it worked great. but the key to a good performance is heat. my room got cooler as i applied the stuff and i notice a significant performance decrease. soif you want to be happy with the product heat the room to very high temperature or wait until summer to use. Rated 1 out of 5 by Nicolas from Buyer beware I recently used two of the System 600 that I purchased from Home Depot to insulate my crawl space. The first one worked like a charm, but the second one did not. Despite following the same instructions, some of the foam came out discoloured, while some ended up melting and still to this day remains goopy. The foam that did take also does not feel as hard as the foam from the first kit in some spots. I also did not get the same coverage as the first kit. I suspect the amount of chemicals dispensed was unequal because while the white tank emptied, the red tank still feels 1/3 – 1/2 full. I recently contacted the company to see if they would exchange the defective kit for another one. Regrettably the company is maintaining that their product is not defective and that responsibility lies with me, despite me following the same instructions as the first application. I am now out $600 and need to figure out what to do with the failed application. Given the product's price, 50% success rate and the company's unwillingness to exchange a defective product I cannot recommend this product. Rated 5 out of 5 by RonOnTheMove from An AWESOME PRODUCT I have used this product in basements and crawl spaces for years. Trust me when I say if you want a dry warm basement or crawl space, this will far exceed your expecatations and as far as I am concerned. I undertand that fibregalss has a higher rating per inch, BUT this product seals solid so there are no gaps or drafts. I have never had an issue with this product but I have heard other people say that had issues if it is not at the right temperature. I have always kept it in a warm place before using. Oh one other thing, not only us it an outstanding product but it is so fast apply compared to pink batt or sheet insulation. Hello, I am interested in this product but I would like to know if this product is approved by the building codes of Quebec?? Thank you for your inquiry and for your interest in the DAP Touch &lsquo;n Seal/Touch &lsquo;n Foam products. According to Canadian residential building code, low pressure two component spray polyurethane foams can only be used for bead (not cavity) filling/sealing/insulating applications. Because you did not provide any details regarding your intended application or specific building codes you are referencing, we cannot provide a more detailed response. Should you wish to discuss this with us or have any additional questions, please feel free to reach out to DAP&rsquo;s Technical Customer Service Department at 888-327-8477. I understand that the OBC does not allow this product to be used for cavity fill in a home. Is it suitable for use for cavity fill outside the home? Can it be used; ie. will it work as insulation in a shed or a cargo trailer or a sea container? Thank you for your inquiry and for your interest in the DAP Touch &lsquo;n Seal/Touch &lsquo;n Foam products. In theory, the projects (use cases) that you propose are possible, as these types of projects do not typically fall under normal residential building code. However, we would recommend that you consult your local building code office to prior to proceeding, to ensure that the work you intend to undertake does not require their approval. What is the actual coverage? At 2&quot; thick, how many square feet? Thank you for your inquiry and for your interest in the DAP Touch &lsquo;n Seal/Touch &lsquo;n Foam products. The DAP Touch &lsquo;n Seal Pro System 600 Kit Coverage for foam products are expressed as &quot;Board Feet&quot;, which is defined as 12&quot; L x 12&quot; W x 1&quot; Deep (a three-dimensional coverage calculation). Assuming a uniform 1&quot; depth of fill, this kit would cover approximately 600 square feet or 300 square feet at a uniform 2&quot; depth of fill. Please be advised that according to Canadian residential building code, low pressure two component spray foams can only be used for bead (not cavity) filling/sealing applications. I have a 60+ years old house. The insulation in some of the walls could use some improvement. Can this product be used be creating holes at a few locations in the wall between studs and inject the foam in to fill in the gaps of the existing insulation? Thank you for your inquiry and for your interest in the DAP Touch &lsquo;n Seal/Touch &lsquo;n Foam products. We do not recommend the use of our foam products in closed cavity void filling (injection) applications, as the expansion force may cause damaged. It was working great except we only used about half the tanks and we were done. 3 months later I want to spray again using the same tanks. problem is I did not store the tanks in a warm space, it was in freezing conditions.Can i rewarm?or are they ruined? Thank you for your inquiry and for your interest in the DAP Touch &lsquo;n Seal/Touch &lsquo;n Foam products. Storage in cool (not sub-freezing) can ensure/extend the shelf life of these products. Storage or exposure to sub-freezing conditions can lead to degradation of the chemicals, resulting in poor performance and/or failure of the foam. At your convenience, please contact DAP&rsquo;s Technical Customer Service Department at 888-327-8477 so that we can obtain some additional information from you and to help you determine how to proceed. I have a specific question about the valves on the tanks. I see the handles are made of white plastic but does the white plastic handle continue thru to the valve or is the internal valve made of brass like the base of the valve? Thank you for your inquiry and for your interest in the DAP Touch &lsquo;n Seal/Touch &lsquo;n Foam products. The &quot;t-handle&quot; and valve shaft is a made from a single piece of reinforced plastic. I used the foam system about 6 months ago and had a half tank left over. When I went to use the balance of the foam, one of the tank handles broke off and was sealed. Please help me with some questions about the valve so half the tank isn't wasted. Thank you for your inquiry and for your interest in the DAP Touch &lsquo;n Seal/Touch &lsquo;n Foam products. As indicated in the product usage instructions and DVD (included in your kit) under Section 3: Shutdown and Storage between Uses: Partially used foam kits can be reused within 30 days of the initial application by adhering to these instructions: 1. Close the cylinder valves by turning clockwise. 2. Do not drain chemical from the hoses. 3. Push the trigger safety into the locked position. 4. Remove the used nozzle, but DO NOT DISCARD. 5. Wipe the applicator barrel with a clean cloth, making sure the chemical exits are clean. Do not use solvent. 6. Apply more lubricant to the O-ring on the applicator barrel. 7. Re-attach the used nozzle, which will prevent air and moisture from entering the hoses. 8. After 7 days of non-use, remove the used nozzle, dispense a small amount of liquid, then wipe clean and re-seal with the used nozzle. 9. Store partially used products at room temperature (60&deg;&ndash; 90&deg;F / 16&deg;&ndash; 32&deg;C) in a dry area. Do not expose to open flame or temperatures above 120&deg;F (49&deg;C). 10. Products must be re-warmed to 70&deg;&ndash; 90&deg;F (21&deg;&ndash; 32&deg;C) before re-use. Failure to strictly adhere to these instruction will result in reusability issues. i want to spray foam a crawl space about 4 feet ...unheated....i live near ottawa ....can this be used in temperatures under 10 C??? Thank you for your inquiry and for your interest in the DAP Touch &lsquo;n Seal/Touch &lsquo;n Foam products. As indicated on the product package guidance and enclosed usage/information package, product usage temperature ranges: &quot;CHEMICALS (70&deg; - 90&deg;F/21&deg; - 32&deg;C), SURFACES (60&deg; - 90&deg;F/16&deg; - 32&deg;C), AIR (60&deg; - 90&deg;F/16&deg; - 32&deg;C). Application of the product outside of these temperature ranges will lead to poor performance and/or failure.